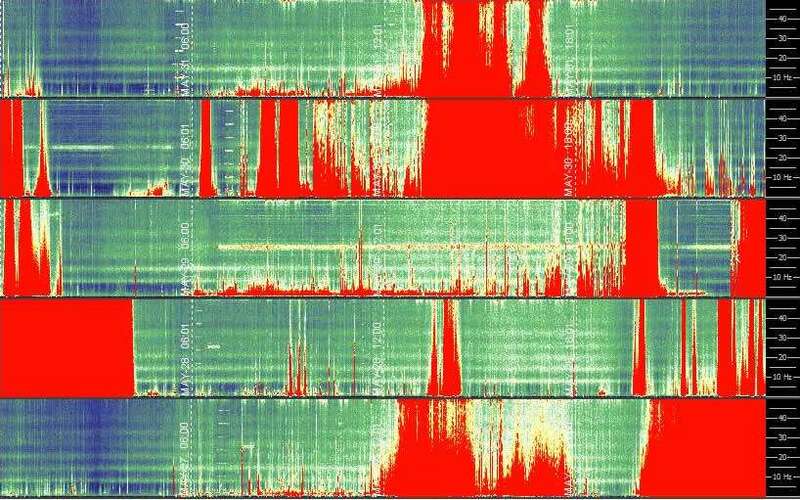 Schumann Resonance Today 6/1/2018 We will try to keep you updated about the variations of the Resonance with this page. The great variations that nobody can explain but that give us a clear sign that the planet is changing. The Earth is vibration higher and higher, just like us! Two significant spikes happened today, plus one less powerful. The first one was just before midnight UTC and went very close to 40 Hz. the second was at 7:30 UTC and went above 40 Hz. while the third that lasted one hour topped at 30 Hz at 13:00 UTC. Today the Italian chart is in agreement with this moderate activity. As suggested we arranged the images in an Archive page where all of them are arranged in chronological order for and easier consultation, you can find the link in the banner below. The below real-time trace is updated every 60 seconds and shows meteors detected over the presceding two minute period. Time is shown as Universal Coordinated Time (UTC) which is an intenational time standard equivalent to GMT. This avoids regional confusion with local time zones. “This Hour” is the number of counts since the beginning of the hour. “Prev Hour” is the number of counts in the last full hour. “PHR (15 min)” is the “present hourly rate” based on a 15 minute sample. This entry was posted in Uncategorized and tagged 2018, active volcanoes, Disclosure News Italia, June 1, love, meteor strikes, Schumann Resonance. Bookmark the permalink.